I Need Your Thoughts: Is Paint the Answer? If money were no object I’d replace the door with a Crestview door, to imbue our 1990s bungalow with the mid-century inspired simplicity I’m inching toward. We’re thinking of eventually turning the carport (behind the door) into an enclosed garage, so our main entrance might, quite literally, not see the light of day. In that case, a cheap, simple option would be great. I found a plain slab door that rings in at about $300 (we need two). But the window-less door will certainly darken the hallway, and our garage plans might never come to fruition anyway. There’s another window-less version that’s really popular at the hardware store and it’s much cheaper. The ABM studio recently got one and they painted it turquoise (I’m drooling over here). I love the colour, obviously, but the differently sized panels totally make me twitch. Why can’t they be the same size?!? I literally see someone buying one of these doors every time I venture out for reno supplies. I could probably even snag one in the classifieds for even less. In our city, I have yet to find a plain door with a window. It’s an elusive combo. All I can find are doors that are incredibly ornate or traditional looking – even the plain slab I finally tracked down is a special order. The miserly part of me says “just paint the door you have!” while the optimist says “don’t waste time and money on a temporary fix – hold out for the one“! You know my style and my vision for the lakehouse, so what do my lovely readers say? I think that, for now, I’m going to go with the majority and paint our existing door. We have no shortage of projects to tackle this summer – some of them quite pricey – so our budget will appreciate an inexpensive solution. But like so many suggested, I’ll keep my eye out for “the one,” or maybe next year we can build a custom door like some readers proposed – I think we’re up for the challenge! Thanks so much for all of your feedback!! 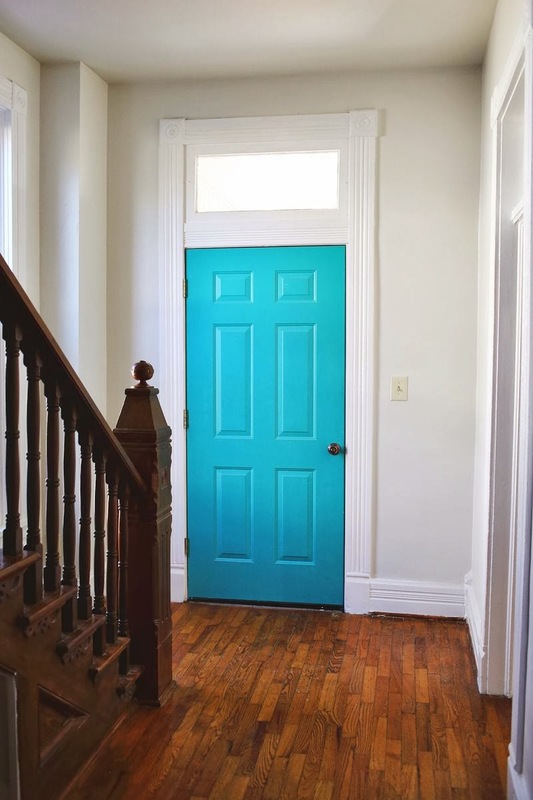 If you paint the existing door, you could make it look more like your 1st inspo pic by frosting the half circle window. I have a similar door and i actually removed the plastic moulding that separates the single pane of glass (makes it look like there are three panes but there is only one) I cut out the inner plastic pieces and put the moulding frame back on the door and seal with caulk. I had no idea that moulding comes off!! That's such a good tip because that would definitely help it look a bit better. Thanks so much!! You could probably remove the decorative overlay on your existing doors window quite easily to modernize it a bit, and the cheery orange is fantastic, especially as a stage 1 update. The orange is sweet, isn't it? It's Hubby's favorite colour and I think it pairs well with my favorite (turquoise), although I really want to paint the door turquoise, lol. Oh man! I so wish I'd know about Crestview Doors before settling on my metal slab door (flat, 1 panel) as an affordable option. Good to know about anyway. Pinning it for the future front door upgrade!Looking good lakehouse! Crestview doors are pricey, though. But just so gorgeous. I have no idea about the quality, either . . . This is such a timely post for me, as we are also looking for a new door for our 1950s house. I love the Crestview doors. Door shopping can be overwhelming, can't it? It seems there aren't a lot of affordable options for people with more vintage or modern style. At least, not in my city! I hope you find the perfect door for your 50s home!! I like the survey option! I comment on posts in my head, but they rarely make the leap onto the internet (so this post is wild and crazy for me, ha). 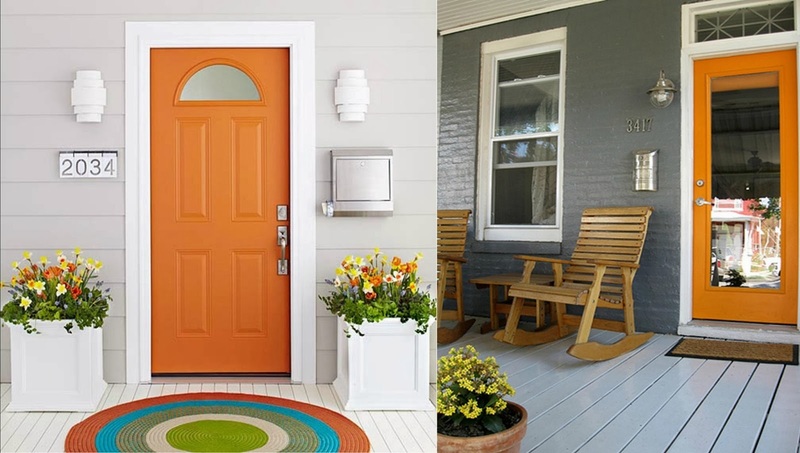 I'd paint the door you have and save up for a very cool Crestview door. While we're at it, I'll pretend you asked about the wood paneling too and vote for the horizontal style–that looked so much better and more modern to me! When I built my secondary suite, I decided to use an inexpensive ($126) steel entry door with no window, and I've been very pleased with it. Once painted, it looks the same as wood. Our front door that faces the street it much more traditional than I like, but the coat of orange paint really made it look better. Not long ago, someone GAVE Joe an original mid-century door. We're going to take it to the guy who refinishes all the furniture for the store and have him strip it and paint it orange.If the fan light door you have is making you crazy, there's a good chance Handy Hubby may have the skills to make AND install custom door-lites for the wood slab door you've located. If you already have him too loaded down with projects, a local glass company can probably make the kits and a local carpenter can install them. From what I've read, this is a lot less expensive than you might think, and you'd have exactly what you want. How lucky to score an original mid-century door! Great tip about getting a local glass company to make a door-lite kit . . . I'll have to look into some DIY options for a chic door because I'm not finding one within our budget, or city limits. Yes, the non-window version and the plain slab are not enough of an uplift to justify taking money you could otherwise put toward The Door. I have the panelled door in fab glossy orange and it is classic and cheery. 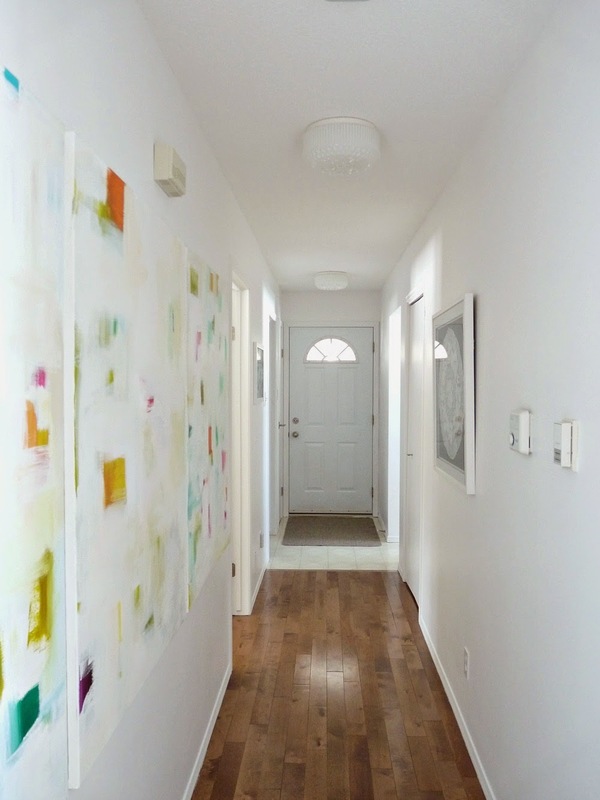 Paint the existing door as a stop gap and go for the MCM door when you feel you can splurge. Thanks Ginny! It does feel counter-productive to spend money on something that isn't perfect . . . but then, my "perfect" seems pricey. So many decisions: where to splurge, where to save . . .
Stained glass would be so pretty!!! There seems to be some debate about the status of Crestview Doors. Their website is still up, but they seem to be in a state of transition. Last year they decided to go up-market and raised their prices as much as 350%, and now there's a contact form on the site that says "Coming Soon! To receive updates as soon as Crestview doors are available at your local hardware store, please fill out the form below." Some Austin residents are saying they aren't returning phone calls or emails, and their warehouse is closed. Others are saying they're out of business, but I read a comment from their co-founder and CEO written just a few days ago, and she didn't indicate that they had ceased operations. It looks as if they're going to start selling through select hardware stores. Oh no! I did read a lot of very bad press about the price hikes. Definitely became out of reach for a lot of people. Maybe they will revamp and come out with more affordable doors. Such an optimist I am, but it's reason to wait and see..
Our door is metal, so it might be tricky to attach things to it. Such a great idea for a wood door! It could be possible though and it would be nice to make the door work because it's in fine condition. You've given me something to think about, thanks!! 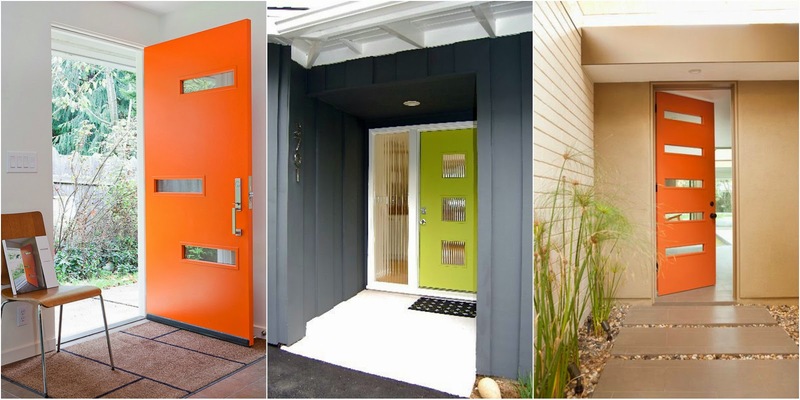 I love that second orange door- it was one of the first images I pinned many, many pins ago- for door colour ideas; I loved the orange/grey combo but couldn't convince hubby. We had the same half moon window- not my fave either. Were you not able to special order a door like that one or were you thinking that you'd rather have a truly mcm style door if you were going put out the cash for a new door? Seems odd that there are so many classic options and pretty much nil for modern tastes. I tried looking on some Canadian building supply sites to check for modern options but I assume you've already explored that avenue. I'll keep an eye out for other possible suppliers. I hope you find something to your taste for a reasonable price. I find it aggravating when a style that I like the rare commodity, meaning that the common preference is readily available and cheaper- in the end, no difference in materials or manufacturing just a 300% mark up. Urrrrghh! Ooo, the glass one? It's so pretty, and would let in so much sunlight (first I typed "sin"light, lol). The glass version was veteod by Hubby so I only looked at doors with smaller windows. Not sure why he doesn't want a glass door, because our patio doors are all glass so it can't be a safety/privacy concern . . . I can't find something modern with a half window. The few simpler doors I tracked down locally were $1000+ and we need two. The Crestview doors are even more, but they are modern like what I want but have smaller windows for Hubby's weird issue. 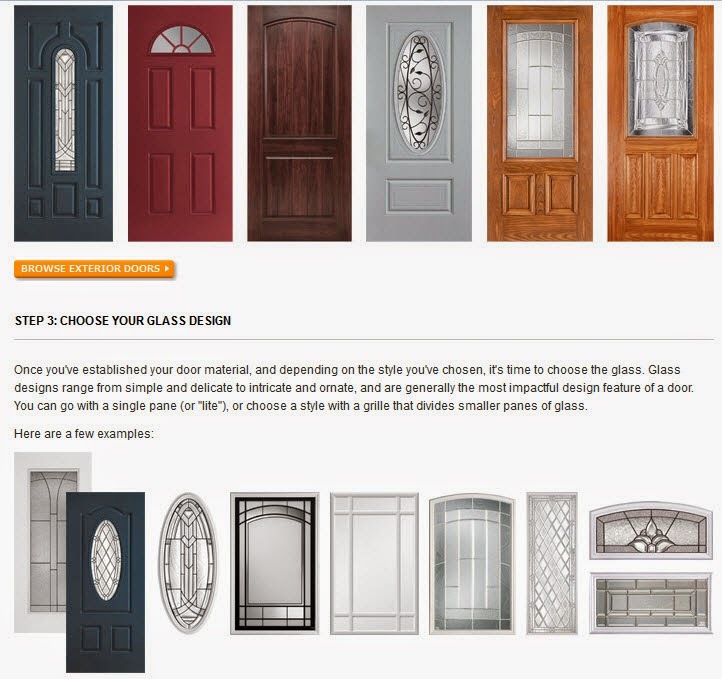 I think in a larger city I might have more options but I'm worried about ordering online for a door because there could be fitment concerns. I'd like to buy from a Thunder Bay-based company for easier returns, if need be. But maybe I should broaden my search. It is so frustrating when so many options are really similar to one another – and so different from what I want!! As soon as I spend a weekend painting our existing door, I'm sure I'll find the perfect one, lol. Oh no, that's my worry: I'll paint it teal and still hate it. The murderer thing worries me with this door – that damn crescent window is too tall!! Maybe we should greet every person who rings the doorbell with a heavy marble rolling pin. Friendly neighbour: "oh hi, I was just baking". Murderer: WHACK. What murderer?Aren't the Crestview prices alarming?? I will shell out money for good quality or design, but those doors just seem a little over-priced . . .
Mari, that is an excellent idea!! Then we can taunt all of the murderes from inside, behind our shatter-proof doors. I'll have to look into that and see what the prices/availability are like here. You're right: the Crestview doors seem far out of reach and what you're proposing sounds far more practical. Thanks so much for the tip 🙂 (and compliment). I say create your own door. Buy the plain slab (solid wood) and add a window or windows like in the Crestview door you like. I'm curious how one would knock on your front door if you close in the carport? lol I totally feel ya, I'm the same way. I hate when people just drop by. I live on the bottom floor of a house with neighbors that are only about 10-12 feet away on both sides and 3 houses in the back that look into my backyard….. I always have my curtains closed cause I just hate the feeling that people might be watching or happen to look in at the wrong time if they drop by (or look out their window lol) and see me walking around half naked in my SPANX or something (well if they do look in they deserve to go blind from the sight of it lol). I'd live in a place like yours and have that beautiful view covered by curtains from paranoia from living here too long. So yes…..I too, like privacy lol. I'm glad I'm not the only one because my snoopy neighbours make me feel so odd about preferring privacy. And you'd think somewhere like here I'd be safe from prying eyes but no. When we were working on the house in the fall, we stopped for a snack on the deck. Moments later some dude came out from the bushes by the shore and brazenly walked up to the deck to introduce himself. Then, to my DISMAY, walked right into the house to see what we were up to. I was so shocked. I was really standoffish but he didn't get the hint. I need to tack up that Grumpy Cat poster to a tree: "Like a good neighbor, stay over there," lol. Yikes, some people just have no boundaries. Not sure how property laws work there, if it's your private property right up to the water or if it's ok for people to be taking a walk along the lake….but if that was me I'd just wave and keep on walking. Might need to invest in some private property signs lol. Definitely not allowed to walk along the beach here – we own right up to it because the municipality needed some of our land for a road, so rumor is they gave us the beach which is public most places. He was being "neighbourly," which I'll have to explain in no uncertain terms is not cool. A lot of people live here only during the summer, and he's one of them, so this street has a cottage vibe for him, which is more social I guess. I think we're the oddballs, wanting our privacy.